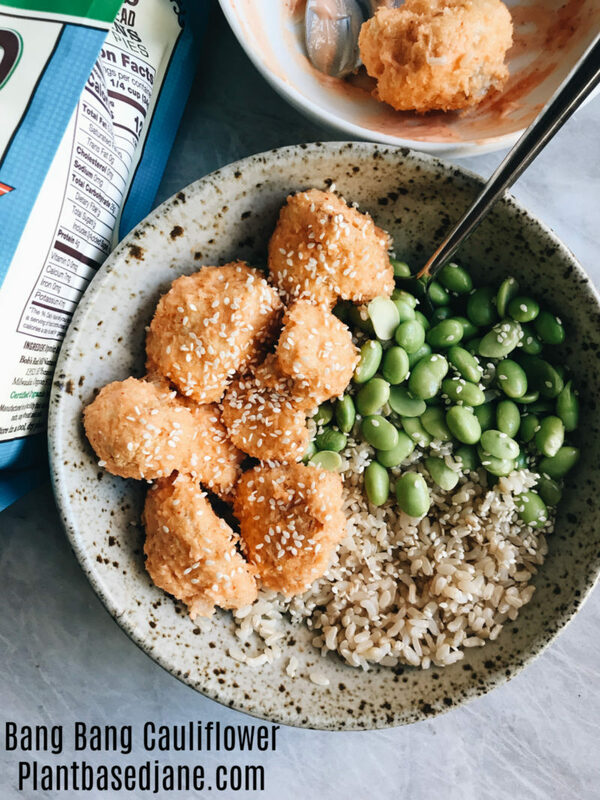 Bringing the classic back once again but in my new favorite way – bang bang cauliflower! 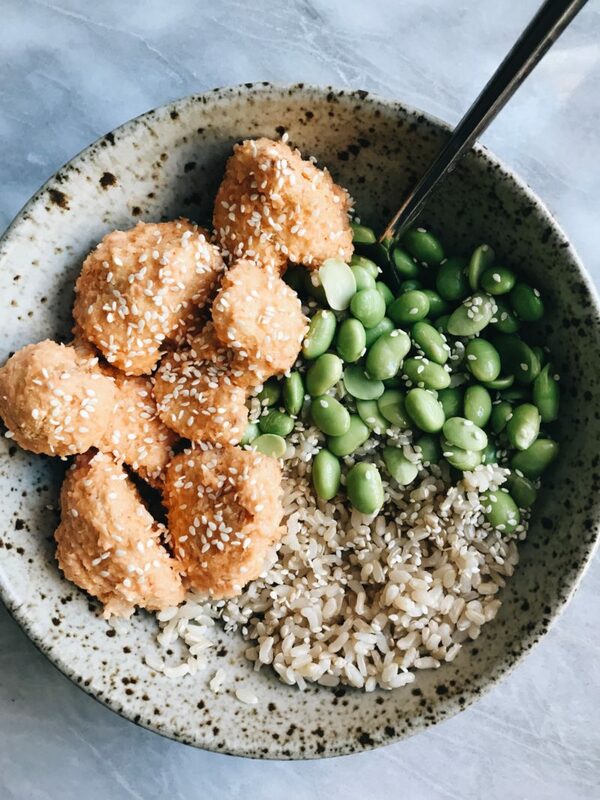 One of my favorite recipes on my blog is for my Bang Bang Tofu. I have gotten a ton of requests to create the recipe using various veggies or other plant based protein options, so today we went with Cauliflower. Im not sure why, but cauliflower is such a fall/winter veggie for me. I am constantly roasting it this time of year. Since my bang bang recipes are always baked, I thought this would be the best time to share the recipe. These “bang bang” variation recipes are also my mom’s favorite. This is quite shocking because she isn’t really into the whole sriracha/spicy meals but for some reason she is HOOKED on these. I think the creaminess from the Vegan mayonnaise really brings it together as well as the crispiness of the cauliflower. What I love about this recipe is how crispy it is, even though I don’t fry it. I’m a little scared of frying things. Not because of the lack of health benefits or getting burned by the oil (okay maybe the burning part scares me a little bit), but because frying can be an absolute mess. Oil flying, getting all over your stove, floor, is just a mess. I just love having my little flour & panko dipping stations and just sticking them in the oven and letting them do their thing without constant watch. Even though it may take a little more time, the little clean up is worth it in the end. In order to make it crispy, I use panko breadcrumbs. 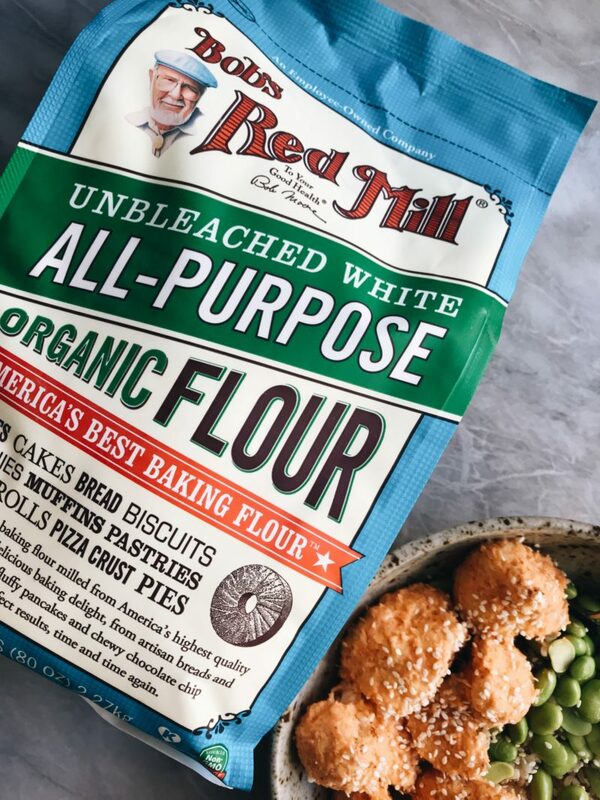 To make the breadcrumbs stick, I use a mixture of water and Bob’s Red Mill Organic All Purpose Unbleached White Flour. 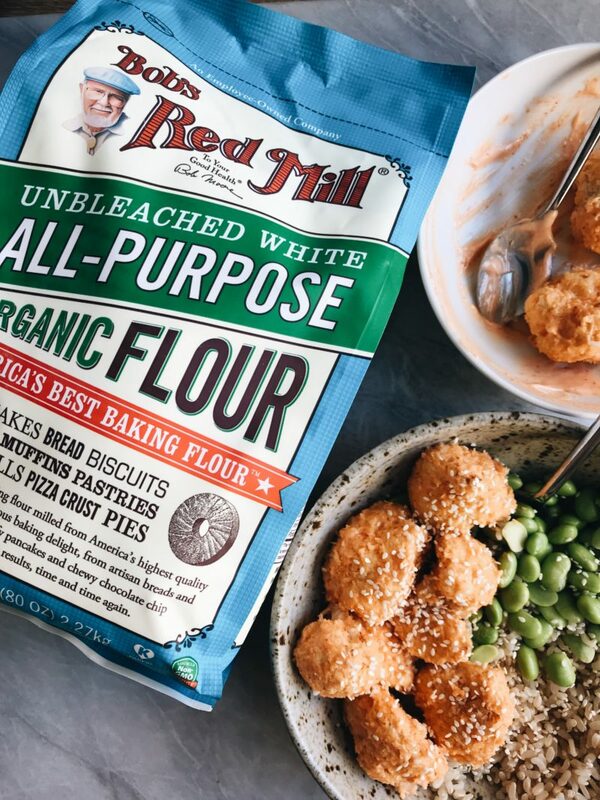 Bob’s Red Mill is my go to for flours, grains, oats, etc. Most of their products are Vegan and they’re super easy to find in stores. You can also order their products online. I use their flour for coating my “bang bang” recipes, baked goods, and super easy pancake/waffle recipes. Bob’s Red Mill is Employee Owned , and the family their team has been able to build is super inspiring and heart warming. Begin by pre-heating your oven to 400 degrees Fahrenheit. Cut your cauliflower into small florets, and set aside. Set up your breading station. Combine your flour, garlic powder, onion powder and water in a bowl. Add water gradually to form a slightly thinner version of a pancake batter. You don't want it too thick. 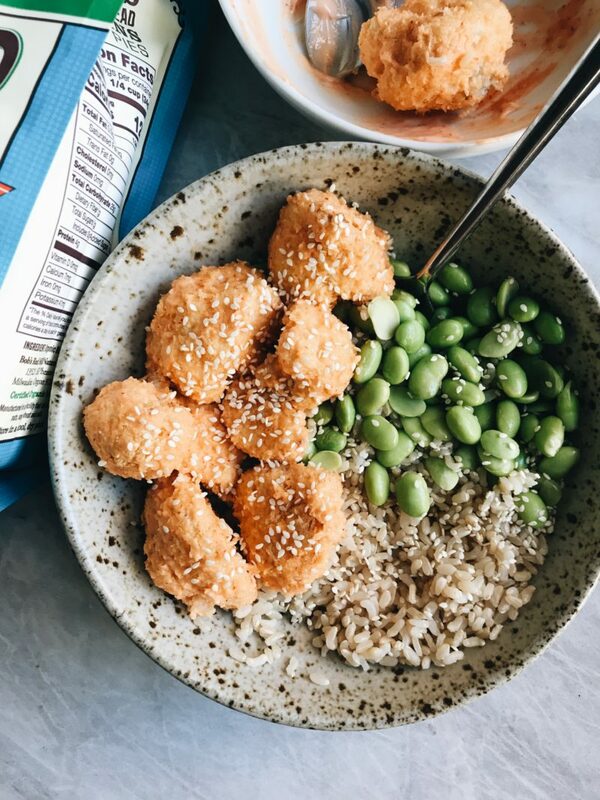 Add your panko to another bowl and begin the process. Dip each floret into the wet batter, to the panko, to a baking sheet lined with parchment paper. Make sure all florets are evenly coated with batter and panko. Repeat process until all the florets are breaded. Place in oven for 20 minutes. After 20 minutes, flip and cook an additional 20 minutes. Ovens vary, so keep a watchful eye. While the cauliflower is cooking, make your sauce. 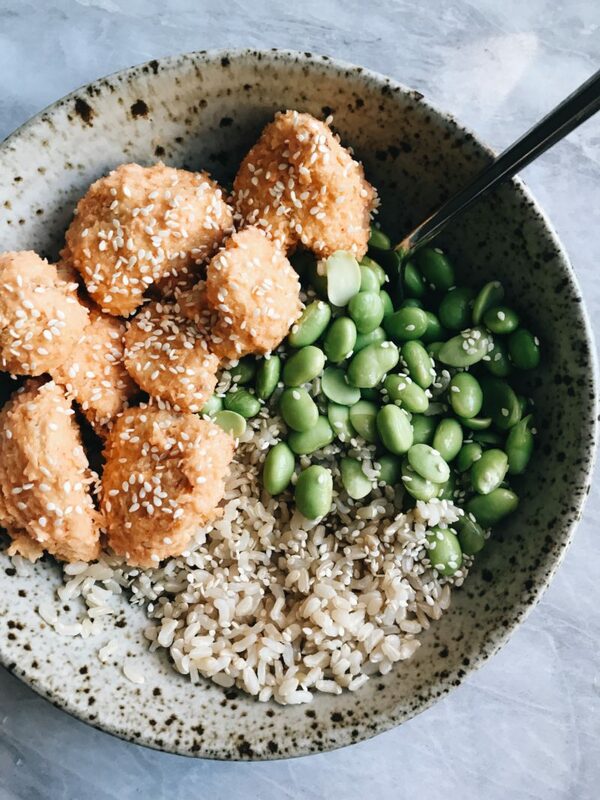 Combine your vegan mayo, Sriracha & rice vinegar in a bowl. I added 2 tablespoons of Sriracha but add as much as you like depending on level of spice. When your cauliflower is done, place in a bowl and pour sauce over. Mix until evenly coated. I coat with tongs for 1-2 minutes making sure all the florets are completely covered in sauce. Thank you to Bob’s Red Mill for sponsoring this post. It means a lot to me to work with brands I love and support my blog.